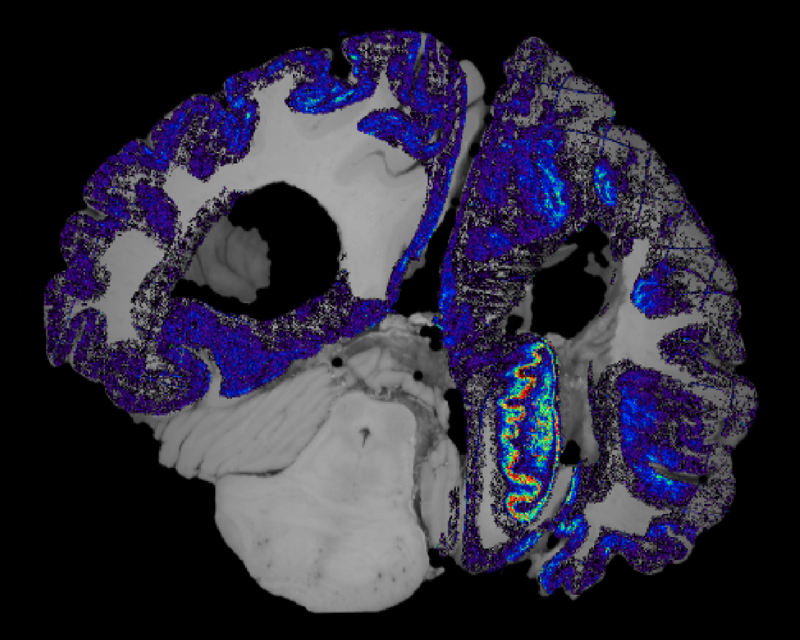 BIDS/ICHS Data Science Fellow and Computer Scientist Maryana Alegro uses computer vision, machine learning and medical imaging to generate and analyze large-scale protein maps of the human brain. Her maps are used to develop and validate imaging biomakers for the early diagnosis and treatment of brain disease. Alzheimer’s disease (AD) is a devastating neurodegenerative disease marked by progressive loss of cognitive function. In the last decade, Alzheimer’s disease is the only leading cause of death to have increased in frequency – nearly a 90% increase between 2000 and 2014. Currently, 5.5 million Americans have Alzheimer’s disease, and by the year 2050, this is projected to increase to nearly 13.8 million Americans, costing well over $1 trillion annually in health care. Alzheimer's is a progressive disease, meaning it starts in smaller regions of the brain and spreads as the disease persists, leading to more severe symptoms. The development of an effective treatment has been limited by the delayed timing of diagnosis. 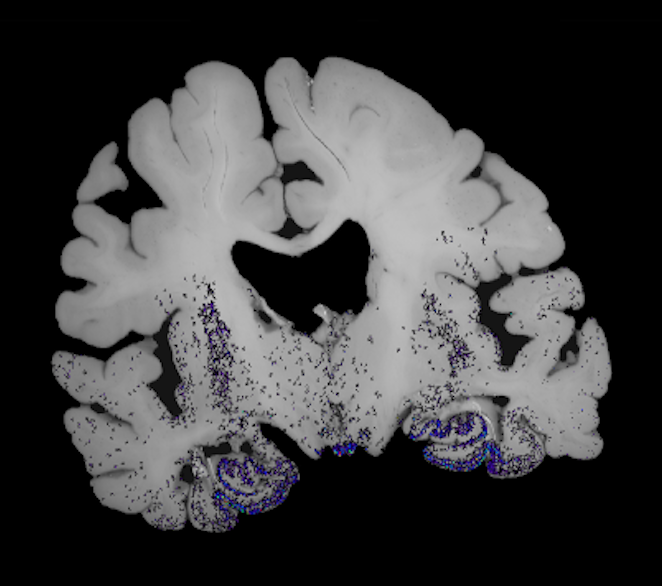 Deposits of abnormal Tau inclusions in the brain are a well-known AD pathological feature and are the best predictor of neuronal loss and clinical decline. As such, Tau is a potential in-vivo imaging biomarker that could leverage earlier diagnosis. Assessing Tau presence in the living brain, however, is extremely challenging since it's not captured by clinical imaging exams, such as Computerized Tomography or MRI. On the other hand, Positron Emission Tomography (PET) has shown encouraging results in imaging Tau, with several research initiatives trying to develop Tau tracers for the human brain. Validation of such studies is only reliably performed using histological data, where Tau inclusion can be accurately located. As part of her research as a postdoc fellow at the UCSF Grinberg Lab - and in collaboration with Duygu Tosun from the Center for Imaging of Neurodegenerative Diseases (CIND), located at the San Francisco Veterans Affairs Medical Center (SFVAMC), and Daniela Ushizima from LBNL - Maryana uses computer vision and machine learning to analyze billion-pixel digital pathology images and create high-resolution Tau protein maps that can be used for PET tracer validations. Whole human brain pathology datasets span several Gigabytes of data and carry thousands of inclusions, making manual labeling unfeasible. Maryana has developed an imaging processing pipeline to pre-process the massive datasets, comprised of stages that include automatic stitching on massive amounts of image tiles, registration and automatic segmentation using convolutional neural networks. Most of the image processing is performed by the UCSF Wynton cluster. The neural network is run on a powerful GPU, and we then compute Tau maps that are aligned to the MRI and Tau PET, allowing direct comparison between PET signal and percentage of Tau. Besides PET validation, we hope such maps can be used for modeling the Tau spread, shedding a light on disease development.